Sorry for delays… now BACK ON TRACK! 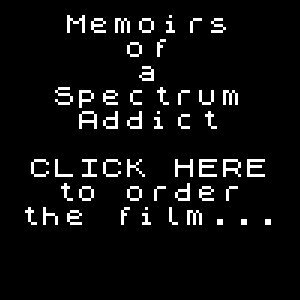 Okay, Memoirs of a Spectrum Addict, the film about the ZX Spectrum computer, is powering along, good and strong. Latest news includes acquisition of film footage from Steve Wetherill (NODES OF YESOD, ROBIN OF THE WOOD), Mev Dinc (GERRY THE GERM, LAST NINJA 2), Roger Kean (CRASH) and Oliver Frey (CRASH); Oliver Frey is working on the film’s artwork, Clive Townsend (SABOTEUR) is creating in-game loading screens, Mark R. Jones (OCEAN) helped massively with hundreds of stills, yesterday I rebuilt the entire front-end of the film using haunting music from Rob Shedwick (DIGITAL FRONT) and today was spent in the sound studio recording voice-overs. Breathe. So, busy busy busy onwards and upwards!! ETA soon! !